This is part of my Girl’s Guide to Turkey Hunting. Be sure to check out the other posts in this series! PS. Thanks to Kristin with Anxious Hunter blog for consulting on this post and for teaching me so much! I hope this informal guide helps you feel capable of going turkey hunting for the first time. Happy hunting, ladies! I definitely recommend hunting in the Spring season. (There is a Fall season as well.) The wildflowers are out, the weather is cool, and the males are strutting around with their feathers on display for females. 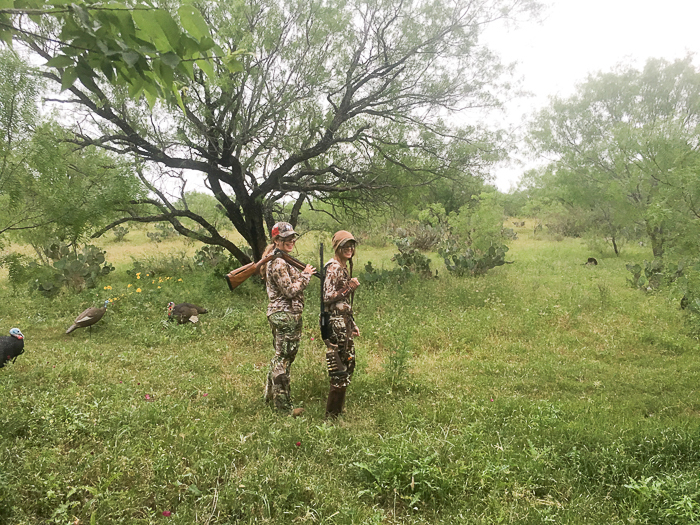 Season” defines when it is legal to shoot turkeys, and in Texas the two seasons usually run November – January and April – May. For specific date, look at the Texas Parks and Wildlife Department rule book online or pick one up when you get your license. Also known as the “bag limit”, this refers to how many animals you are allowed to shoot. 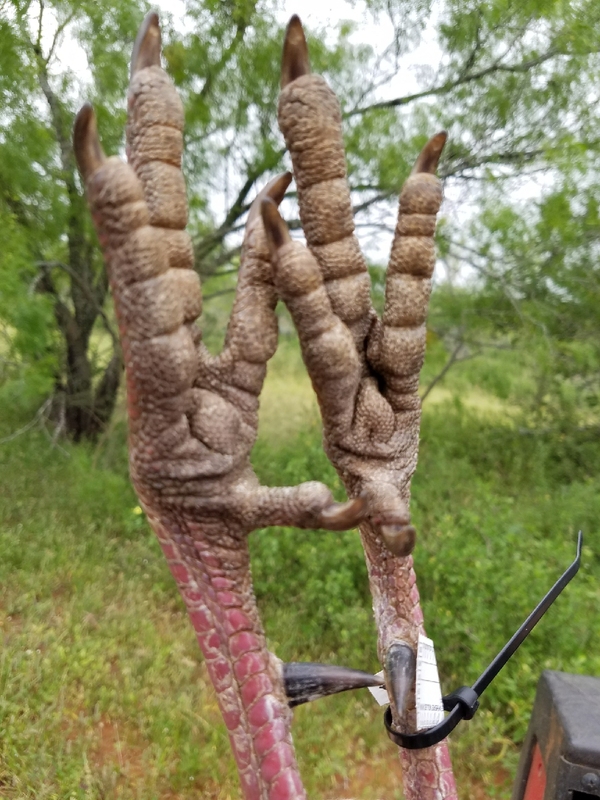 The annual bag limit in Texas is typically 4 gobblers (males) or bearded hens (female with a long beard hanging down) and one of those can be an eastern turkey. However, bag limits can change from year to year and county to county, so always be sure to check in the rule book I mentioned above before going afield. I recommend 12 or 20 gauge shotgun. Some people hunt turkeys with rifles but a shotgun will preserve as much meat as possible. Shotgun shells are packed with small bb’s that disperse when you pull the trigger, whereas rifles shoot bullets that are much more impactful on a single point. If you shoot it with bb’s, you will only be picking a few bb’s out of the meat versus having half the meat blown up by the rifle. And, you have larger chance of hitting it in the head because of the dispersed bb’s, versus the single point of a bullet. It’s like drawing a dot with spray paint versus a marker. Comprende? 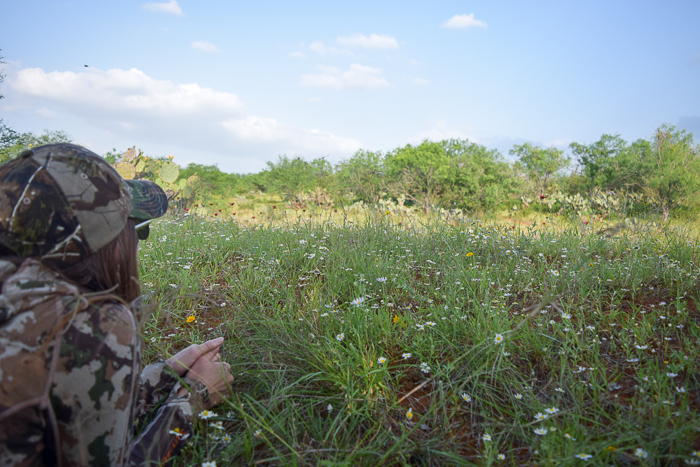 Get your hunting license and take Hunter Education course (required in Texas) in August or September, before the season starts. See post linked above for how to purchase a hunting license. As a rule of thumb, animals are more active in the hour after sunrise and the hour before sunset, and you want to be outside when they are active so that you see them. Turkeys are no different. Choose your hunting location the night before, and get there before the sun has risen. You want it to be dark when you arrive in the morning so you have time to get in position before the turkeys come. In the evenings, head out around 4:30. I enjoy hunting in the morning because the birds are more lively and curious at that time, and in the evenings they are not as easy to attract. But that has just been my experience so far. Calls: The idea is to replicate the sound of a turkeys clucking and gobbling. (Which are very comical sounds! Check it out on YouTube.) A male turkey, also known as a tom, is going to be motivated by two things: mating or territory. The sound of female turkeys is attractive to him, and the sound of another gobbler is going to make him very curious about who is around. Complete set here. Decoys: These are lightweight, plastic turkeys that you set out about 30 yards from where you are sitting. I watched a big tom strut around our decoys trying to prove his worth to the hens, and it was a lot of fun to watch. If you are using a 12 gauge shotgun, you’ll want to shoot within 40 yards. 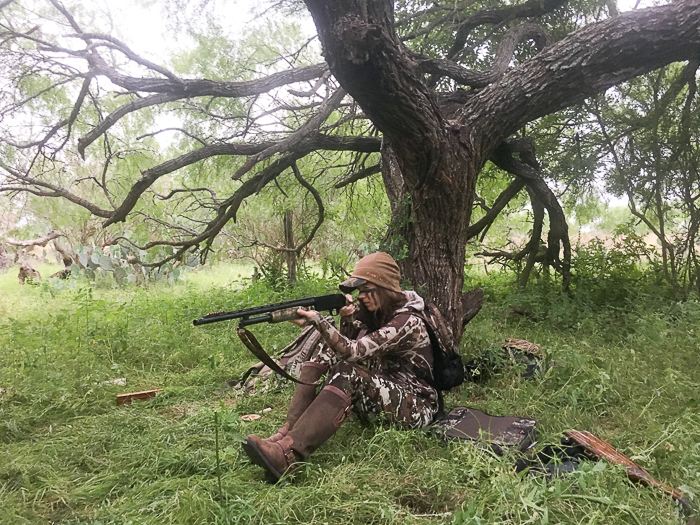 This is one of the things that makes turkey hunting challenging and therefore a lot of fun–you have to call the turkey in to within 40 yards, and to do so you have to be very quiet and camouflaged. An easy way to measure distance is to set your decoys 30 paces (1 pace is about a yard) from where you’ll be sitting, and that will give you a good guideline. Don’t shoot anything farther than 10 yards from your decoys. The evening before you go hunting, go outside and find out where the turkeys are roosting and what their patterns are–if any, because you’ll want to hunt in that area. Typically they like to roost in tall, old trees near water. You can use a predator call (like a coyote, which you can buy here on Amazon) to get them to gobble and tell you where they are. Or you can use your turkey call and they will gobble back if they hear you. Set up either under where they are roosting or just a short ways away (around 200 yards) so you can draw them in with your calls and decoys. The idea is to blend into the landscape, so find a tree and sit with your back to it. You don’t want to be sticking out like a sore thumb! Even better if you can find a tree with some foliage to camouflage you. Make sure your line of sight for where you plan to shoot is clear, and there aren’t any branches or brush in the way of your shot. Not that you can always predict which way a turkey is coming, but in general try not to have brush blocking anywhere you may want to shoot. BTW, what is a beard and why does it matter? This was one of those questions I was too scared to ask when I was still learning about turkey hunting! Just as deer trophies are measured by the size of their antlers, turkeys are measured by the length of their beard. Why? I don’t know. The beard grows out of their chest and is a clump of black course hair that hangs down about four or so inches, or more depending on how old the turkey is. 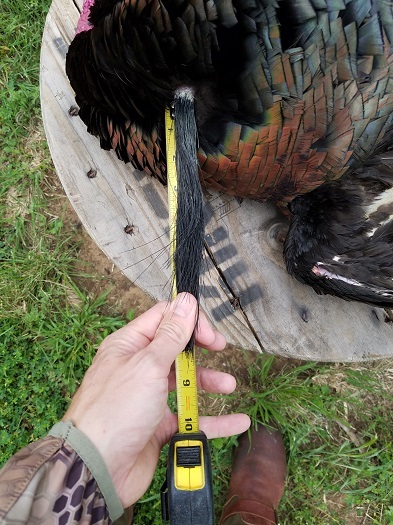 People also measure turkey’s spurs, which are the little hooked talon you see kind of like a thumb in this picture. The longer the spur, the older the turkey. Once you shoot a game animal in Texas, it is imperative that you tag it with the tags that come with your hunting license. As you can see in the above picture, this turkey was tagged using a zip tie. Duct tape also works great. You will get fined if a Game Warden encounters you with wild game and no tag! Good luck out there, y’all! Fellow turkey hunters feel free to chime in with good advice. No Replies to "Turkey Hunting Basics You Need to Know"